A massive plume of Saharan desert dust (light brown pixels) continued its westward trek across the Atlantic Ocean on March 4, 2003, being held aloft and swept along by strong winds. The plume covers a vast expanse of ocean, roughly equal in extent to about half the land area of the contiguous United States. 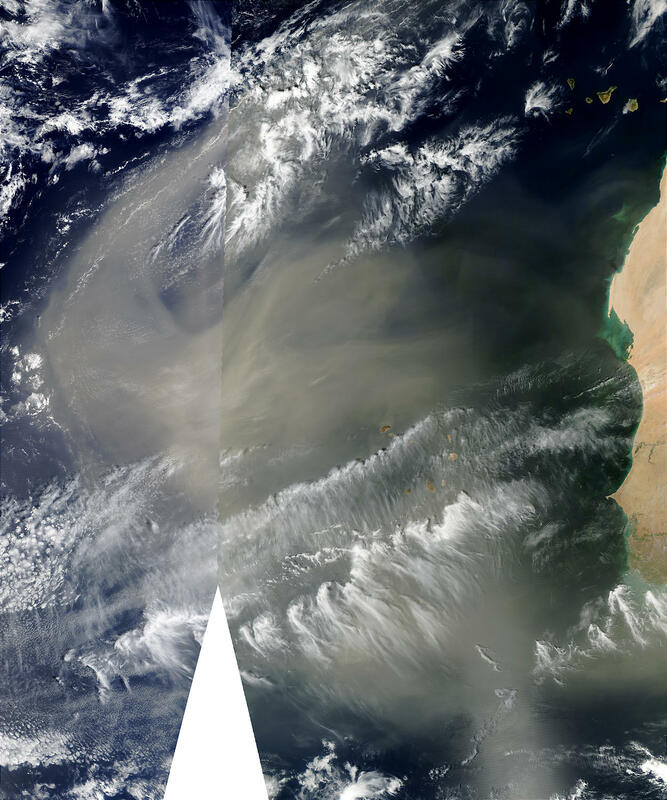 This true-color image of the dust storm was made by stitching together two images acquired on the same day by NASA.s Terra and Aqua satellites. Notice the vertical discontinuity running from top to bottom through the center of this scene. The image was made using data from the Moderate Resolution Imaging Spectroradiometer (MODIS) sensors flying aboard both spacecraft at hours apart on March 4. The scene appears a bit different to each satellite not only because the clouds and dust plumes are moving, but also because the relative angle of the sun is changing. In the right-hand image (Aqua MODIS), you can discern more dark green structure in the Indian Ocean, indicating the presence of phytoplankton. The intense biological activity going on there is quite likely being enhanced by the influx of iron-rich desert dust settling into the waters there over recent days.